After the acquisition of Marcus Garvey Apartments (MGA) in 2014, L+M began working in the Brooklyn neighborhood of Brownsville for the first time. L+M sought to revitalize the 625-unit complex with apartment renovations, the installation of alternative energy solutions and various other improvements on the grounds including the construction of a children’s playground. To further enhance the lives of residents, however, L+M also brought in nonprofit partners and grantees to further support residents through programming and services and in order to do so, L+M initiated a comprehensive community-focused survey. After coordinating with a local community partner to determine the specific wants and needs of residents living at MGA, L+M’s Community Investment team was able select three nonprofit partners to best support residents and their families. L+M asked Project EATS—a nonprofit committed to bringing fresh food, nutritional education and job opportunities to New York & New Jersey urban communities—to convert a one-half-acre vacant lot to an urban garden to help address the shortage of healthy and fresh food in the neighborhood of MGA. Project EATS has been working to install farms and provide fresh nutritious food to communities in need since 2009. 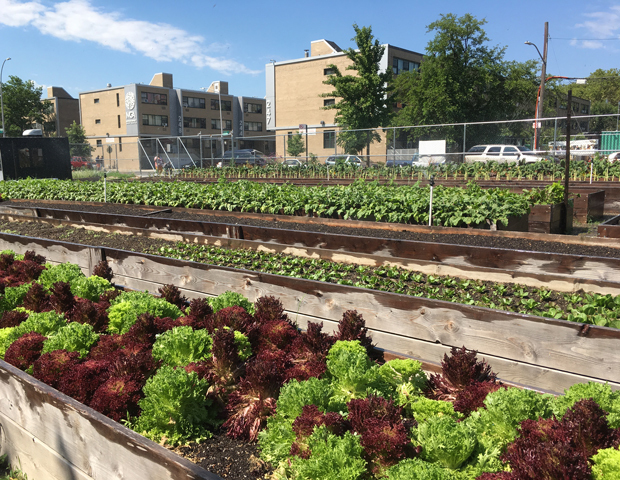 When brought in to install a farm at MGA, L+M employees volunteered to build the farm that now operates as a fresh food hub in Brownsville and today, the lot has been transformed into a vibrant farm. Serving the needs of the local community, the farm focuses on salad greens, kale, collards, callaloo and other crops that can grow all season. Twice a week, the farm opens for business, inviting the local community to purchase produce at affordable prices. To further support the farm, Project EATS also sells its goods to local restaurants and at farmers markets at slightly higher prices to subsidize the lower charges in their neighborhoods. Additionally, the organization offers cooking demos, jobs on the farm and workforce training for those looking for careers in cooking or nutrition. They also host community dinners throughout the spring and summer seasons. “Our work aims to make food available and affordable, strengthen resident ties to the community and create healthy opportunities at the farm that support the community’s ability to thrive long-term,” says Linda Bryant, Founder & President of Project EATS. While L+M works to address the shortage of affordable housing, it is through partnerships such as this that we can help address other urgent needs of not just L+M residents but Brownsville residents, and more holistically support the community. The MGA farm is an example of the ingenuity of our community partners and also a template for how to address the urgent need for healthy food in neighborhoods classified as “food deserts”, or those neighborhoods where fresh food is either unaffordable or unavailable. Today, MGA residents only have to walk next door for fresh greens and herbs, something that was impossible in 2014.